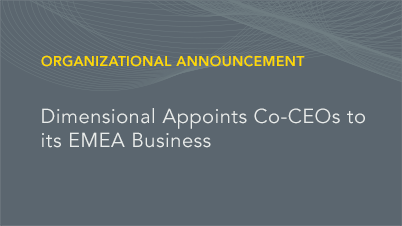 Nathan Lacaze and John Romiza, directors and senior members of Dimensional’s leadership team in London, will become Co-CEOs of Dimensional Fund Advisors Ltd. (DFAL), effective July 1, 2018. After 28 years with Dimensional, Art Barlow, who is currently Managing Director of DFAL, will be retiring in early 2019. Art Barlow is a Director, Managing Director, and member of the Investment Committee of DFAL; a Director of Dimensional Funds PLC and Dimensional Funds II PLC, the Irish funds managed by DFAL; and serves on the ACD Committee, which oversees DFAL’s UK funds. Art will resign from these positions as of July 1, 2018, continuing on in an executive capacity to facilitate a successful transition until his retirement early in 2019. Nathan Lacaze will become Co-CEO of Dimensional Fund Advisors Ltd. (DFAL) in July 2018. * He is currently a director of DFAL, Head of EMEA Portfolio Management, and a member of DFAL’s investment and management committees. Nathan is also on the Board of Directors of Dimensional Funds PLC and Dimensional Funds II PLC, Irish UCITS managed by DFAL. In his role as Head of EMEA Portfolio Management, Nathan oversees the management of existing portfolios and helps design and implement new strategies. He also takes an active role with clients. Nathan joined Dimensional as a trading assistant in 2004 and received a bachelor of chemical engineering and a bachelor of commerce, with majors in finance and economics, from the University of Sydney. He received an MBA from the University of Chicago Booth School of Business in London and is a CFA® charterholder. John Romiza will become Co-CEO of Dimensional Fund Advisors Ltd. (DFAL) in July 2018. * He is currently a Director of DFAL and is a member of DFAL’s investment and management committees. He chairs the Board of Directors of Dimensional Funds PLC and Dimensional Funds II PLC and is Global Co-Head of Equity Trading. In his capacity as Co-Head of Equity Trading, he oversees trade execution strategies and coordinates all equity trading operations across the firm's global trading desks. Throughout his time with the firm, John has worked closely with Dimensional’s client service teams and interfaces directly with clients and prospects. John joined Dimensional in 2008 as Head of International Trading. His career began in 1996 with Fidelity Investments. Prior to joining Dimensional, John served as senior vice president and director of European trading for Franklin Templeton. During his eight years with Franklin, John built the firm's European trading operation; his responsibilities included full oversight of all EMEA equity trading for the parent organisation. He received a BS in finance from Bentley College in Boston. *Subject to any necessary regulatory approvals. Dimensional Fund Advisors is a leading global investment firm that has been translating academic research into practical investment solutions since 1981. Guided by a strong belief in markets, they help investors pursue higher expected returns through advanced portfolio design and careful implementation. With clients around the world, Dimensional has 13 offices in nine countries and global assets under management of US $586 billion as at 31 March 2018. Where issued by Dimensional Ireland Limited: Issued by Dimensional Ireland Limited (DIL), with registered office 10 Earlsfort Terrace, Dublin 2, D02 T380, Ireland. DIL is regulated by the Central Bank of Ireland (Registration No. C185067). Where issued by Dimensional Fund Advisors Ltd.: Issued by Dimensional Fund Advisors Ltd. (DFAL), 20 Triton Street, Regent’s Place, London, NW1 3BF. Company Number 02569601. DFAL is authorised and regulated by the Financial Conduct Authority (FCA) - Firm Reference No. 150100. “Dimensional” refers to the Dimensional separate but affiliated entities generally, rather than to one particular entity. These entities are Dimensional Fund Advisors LP, Dimensional Fund Advisors Ltd., DFA Australia Limited, Dimensional Fund Advisors Canada ULC, Dimensional Fund Advisors Pte. Ltd., Dimensional Ireland Limited, Dimensional Japan Ltd., and Dimensional Hong Kong Limited. Dimensional Hong Kong Limited is licensed by the Securities and Futures Commission to conduct Type 1 (dealing in securities) regulated activities only and does not provide asset management services.